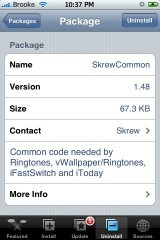 The update to SkrewCommon and vWallpaper adds the ability to set video ringtones. When you open the application, you will see that the main menu has changed and the options now include; Video Wallpaper, Video Ringtones, Visit Application Page and Donate. The Video Wallpaper option itself has not changed. When select the Video Ringtones option, you will get a menu with the following options; Enable VideoRingtone, Select Video, Download Videos, Videos Repository (which is not available yet) and Restart SpringBoard. There is one default video ringtone already in the Select Videos option, you can add more videos by downloading them from the Download Videos section. As of now, there are eight videos available to download from the Download Videos section. After you have selected a video from the Select Video section, you will want to enable videoringtones and then restart your SpringBoard. The video ringtone that you select will be automatically added as the ringtone for all incoming calls. The only thing that drives me crazy about this application is that there is no back button. The Home button brings you all the way out to the main menu when I only want to go back one menu!! Other than that, the application worked good. I did have to turn off my VideosTone ringtones in order to get the vWallpaper Video Ringtone to work. You can get both SkrewCommon and vWallpaper through the Skrew source. This fixed my vwallpaper, but when i downloaded it I got a “main execution failed” or something, everything works but I think this happened because I have a iPod touch and it obviosly doesn’t have video calling. whats the difference between this video tome to the video tone app? and can i get this app to have a video ringtone to each contact? This is great, I added my own videos from MxTube and it worked pefectly. Great app!!!! Dude,how you do that? thanks in advance! First you must have the following installed. When you go into your vWallpaper app, just choose your video in there and you’re all set. thanks ,now I have my owns! I too got this workign perfectly… However…. The videos form MxTube are not the right size to fill the screen… the Coldplay video… which has excellent quality is perfect…. Where or How do we get videos more like this??? I created a new folder and then created symbolic links for all the other apps to the new folder…. i have the .93 version on my ipod touch 1.1.1 and everytime i go into vwallpaper it shows some (french i think) development thingy and then it goes bak to springboard help!!! !